She hasn’t even announced a decision to run for congress and career politicians are already treating her as a threat to the political system they are trying to protect. That’s the response Christine Jones has elicited from the campaign teams and political insiders catering to a flooded field of entitled east valley politicians. Republican businesswoman Christine Jones is no career politician and she hasn’t spent her career climbing the ladder of political offices like others already in the race for CD-5. Jones has risen in her career through tremendous hard work and commitment to conservative business principles. As the first in-house attorney for GoDaddy, she was an integral part of the success of the popular domain name and hosting company. In fact, she was part of the team that helped grow the company to over 4,000 employees. Currently, she serves as the interim CEO of Great Hearts Academies – one of the most successful charter school systems in Arizona. The school has an impressive reputation of high test scores and college-bound graduates. Other than the obvious, Christine Jones is very different from the cadre of career politicians running for this open seat. She knows how to accomplish major goals as both a team player and as a strong woman leader. Any day, she is expected to make a decision and announcement. Should she enter the race, it will certainly stir things up for the cabal of east valley politicians but isn’t that what makes a strong principled leader? If she gets in the race, Christine Jones will be a fresh choice and a strong voice for the citizens of CD-5. 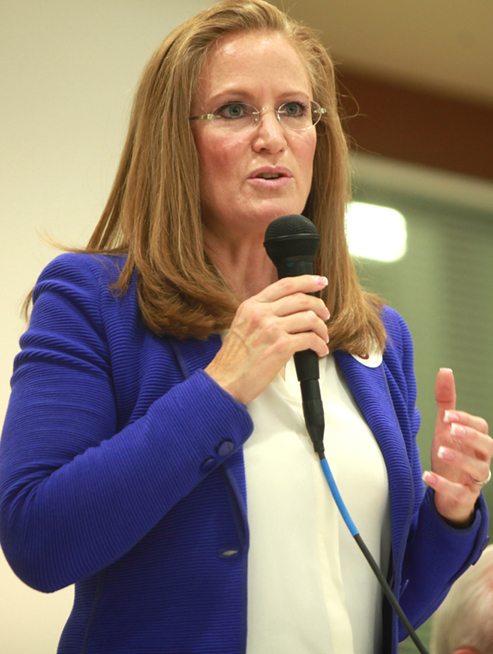 Be the first to comment on "Christine Jones – A Fresh Choice, A Strong Voice for Congress"